MONTREAL, March 18, 2016 /CNW Telbec/ - Produkt is proud to announce that it's teaming up as an official cause partner with One Drop, the Montreal-based international non-profit organization whose mission is to provide access to safe water in communities worldwide. Along with the participation of 45 DEGREES, Cirque du Soleil's Events and Special Projects company, they are turning the world-renowned Bal en Blanc™ festival into a benefit event to help make safe water available to all. On Sunday March 27, Bal en Blanc will feature a One Drop Moment created by 45 DEGREES, to showcase this collaboration and provide attendees with a taste of what's to come. This short introduction to One Drop sets the stage for a larger partnership with Bal en Blanc™ in 2017 with plans to export this concept around the world. The electronic music scene brings together thousands of people with a shared passion for music, generating an incredible wave of universal energy powerful enough to transform the world. The electronic dance music community is a long-time supporter of social causes, both through individual DJs and high-profile events worldwide, which makes this partnership a perfect fit. "One Drop believes in the importance of engaging young people, who make up the majority of Bal en Blanc™ attendees, in a meaningful way because they truly understand the urgency with which we need to move-time is running out for hundreds of millions of us. Pairing One Drop with Bal en Blanc's young, inspired and socially aware audience, has the potential to turn the event into a major mobilizing, fundraising experience for the cause of water." - Catherine B. Bachand, CEO of One Drop. "As new producers, we wanted to take Bal en Blanc up to a whole new level and create an experience beyond all expectations. This powerful partnership gives us an opportunity to do something that makes a genuine and measurable difference. We strongly believe that this partnership with One Drop is a turning point for Blanc en Blanc, which is set to transcend borders. We are proud to share a common goal of worldwide change." – Alex K, President, Produkt. "Through this moment, we aim to create a memorable experience for the Bal en Blanc audience. We are honoured to contribute 45 DEGREES' unique know-how to support One Drop and the cause of water for all." – Yasmine Khalil, President 45 DEGREES. 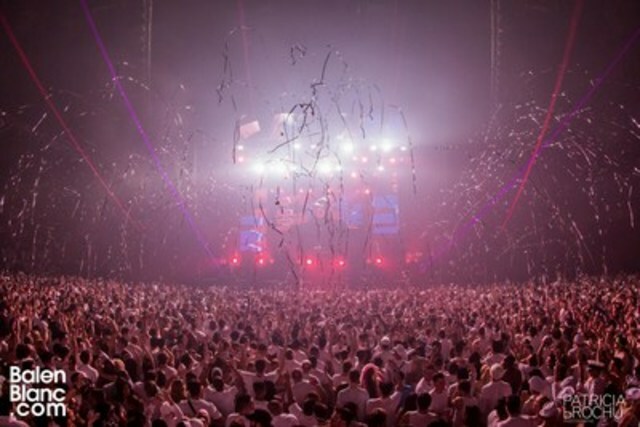 Since it's launch over 20 years ago, Bal en Blanc has become a staple of Montreal's music and cultural scene. Welcoming more than 15,000 people every year, it has grown into the largest indoor festival in Canada. The theme for the 22nd edition, which will be held at Palais des Congrès on March 27, is Hippie chic, a nod to the original source of inspiration for the industrial dance events known as "Warehouse Parties". DJs and producers from all over the world will be performing at Bal en Blanc, including Grammy award winner Afrojack, Deorro, DJ Sneak, Kshmr, Mark Knight, Shaun Frank, Sultan + Shepard, and many more. Arts and culture will also be an important part of this year's event, with the participation of four well-known Montreal urban artists: Stikki Peaches, Jason Wasserman, Whatisadam and Xray. The local art community has also been asked to submit public art installations concepts, from which ten will be selected and exhibited at the event. This edition is destined to become the most impressive of all. One of the founders of the world-renowned venue New City Gas, Produkt is a Montreal-based company that has gained international recognition for the creation of tailor-made events from Miami to Ibiza. Specializing in unique activations and live music production, Produkt is at the forefront of the electronic music industry, connecting brands with the next generation of artists and fans. One Drop™ is an international non-profit organization created by Cirque du Soleil founder Guy Laliberté. At the core of our mission is water as a transformative force to improve living conditions, as well as give communities the ability to care for themselves. Sustainably.